that cupboards of this description were actually of English origin, for that is not the case. They are nothing more nor less than variations of the old French, German, and Flemish "bahuts," or "armoires"; nevertheless, the form in which they appeared, and became popular in this country, was in every respect characteristic of our peculiar national temperament. To revert for a moment to the name " Court Cupboard," borne by the earlier English type. Some people entertain a vague impression that it is to be accepted as signifying that the pieces which bore it originally took their place among the furnishings of royalty. That, of course, is an error. The word "court," as employed in that connection, must be read in the sense given to it by the French—that is to say, as meaning "low" or "short." It may appear hardly necessary to explain this, but as it is not generally understood, it is perhaps as well to do so. 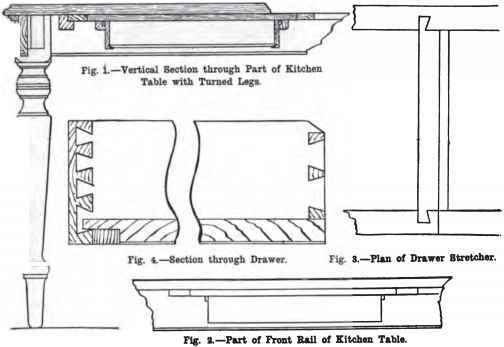 Scores of old " Bread-and-Cheese" cupboards might be illustrated, for many are still extant; but the majority bear so close a resemblance to one another that to show all would serve no particularly useful purpose, and would exhaust considerable space. I shall, then, only indicate a few typical examples, which will be sufficient to represent adequately the whole range of such productions.